Experts have called for NICE to update its guidelines on the use of transcatheter aortic valve implantation (TAVI) in intermediate patients to reflect new European guidance so patients don't miss out on optimal treatment options. Speaking at the recent London Valves conference, experts discussed the European Society of Cardiology (ESC)/European Association for Cardio-Thoracic Surgery (EACTS) guidance on valvular heart disease, in which they lower the threshold for intervention with TAVI to patients at intermediate-risk of surgery. Previously the 2012 guidelines stipulated that TAVI should only be considered for those patients with symptomatic aortic stenosis at high risk of surgery. Currently approximately 1.5 million people in the UK over 65 years suffer from heart valve disease (HVD) with aortic stenosis, the most common form of HVD, affecting 2-7% of the population over 65 years and 13% of those over 75. Expanding the use of TAVI would enable many more patients in the UK to potentially have access to the minimally-invasive therapy, rather than have to undergo open heart surgery. However, having reviewed the same data in their updated Interventional Procedures Guidelines (IPG), NICE did not expand the indication for TAVI beyond the high-risk patient population. The IPG, which was published just one month before the ESC/EACTS guidelines, potentially leaves UK patients at a disadvantage in the treatment of aortic stenosis compared to their European neighbours. The UK already lags behind rest of Europe in diagnosis and treatment rates, with the UK performing far fewer number of aortic valve implantations compared to Germany, France, Norway and Sweden. Dr Bernard Prendergast, Consultant Cardiologist at Guy's and St Thomas Hospital and Course Director/Board Member of PCR London Valves, said: “There is growing evidence in favour of the use of TAVI for the treatment of intermediate-risk patients with severe symptomatic aortic stenosis. This expanded indication in the ESC/EACTS guidelines paves the way for more patients to receive a true alternative to open-heart surgery. The guidelines also recommend that aortic valve procedures should be performed in heart valve centres and choosing the most appropriate intervention must be done by a heart team of surgeons and cardiologists who should consider individual patient characteristics, rather than simply relying on surgical risk scores. 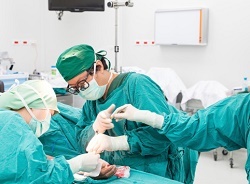 They emphasise that decision making should take into account age, comorbidities, anatomy, and outcomes of the centre for surgery and transcatheter intervention.